The public has become more supportive of government aid to the needy in recent years, and there has been uptick in the share saying they prefer a bigger government with more services over a smaller government with fewer services. As has been the case for most of the past two decades, a majority of the public continues to view government as “almost always wasteful and inefficient.” Opinions remain divided on whether government regulation of business is necessary to protect the public interest. Similarly, there has been a shift in public attitudes on whether the government should do more to help the needy. Currently, 50% say the government should do more to help needy people even it means going deeper into debt, while 43% say the government can’t afford to do much more to assist the needy. This marks the first time since 2008 that significantly more Americans favor than oppose providing more assistance to needy Americans. About seven-in-ten (71%) Democrats and Democratic-leaning independents say the government should do more to help the needy, up from a Democratic low of just 54% six years ago. 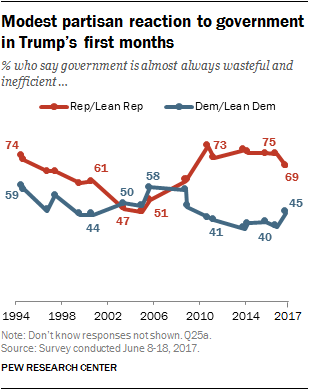 Republicans’ views have shown little change over this period; today, just 24% Republicans favor the government doing more to help the needy, among the lowest levels measured since 1994. Democrats’ views about adequacy of government benefits for the poor also have changed dramatically. Currently, 76% of Democrats say “poor people have hard lives because government benefits don’t go far enough to help them live decently.” This is the highest share of Democrats saying this over the 23 years the question has been asked. Just 25% of Republicans say poor people have hard lives because government benefits do not go far enough to help them live decently; more than twice as many (65%) say “poor people have it easy because they can get government benefits without doing anything in return.” Republicans’ attitudes on this measure have shown relatively little change in recent years, though a somewhat greater share of Republicans (around four-in-ten) said the poor had hard lives just over a decade ago (from 2003 to 2005). Since 1994, there have been consistent differences in opinion by race about government benefits for the poor. In the current survey, 76% of blacks say poor people have hard lives because government benefits do not go far enough. That compares with 60% of Hispanics and only 47% of whites who say this. 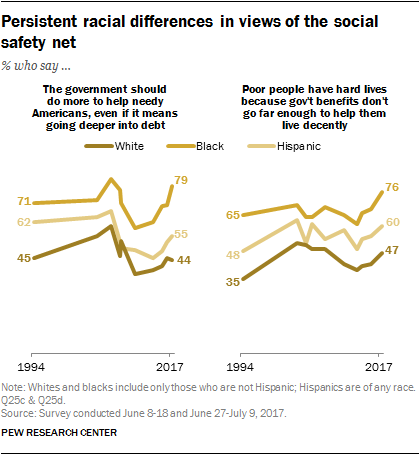 But the belief that government benefits do not go far enough to help the poor has increased across all three groups since 2013: by 15 percentage points among blacks (from 61% to 76%), 11 points among Hispanics (49% to 60%) and 8 points among whites (39% to 47%). For much of the past two decades, majorities have viewed the government as wasteful and inefficient. The share expressing this view hit a high point in October 1994 (66%), a month before that year’s midterm elections. Currently, 69% of Republicans and 45% of Democrats say government is wasteful and inefficient. These views have changed only modestly from 2015, when Republicans were somewhat more likely (75%), and Democrats somewhat less likely (40%), to express this view. In recent decades, partisan views on this question have shifted somewhat in response to the party of the administration. During the Bush administration, Republicans held a less negative view of governmental efficiency, while Democrats were more critical than during Democratic administrations. 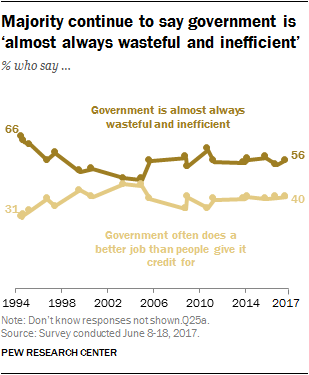 In September 2005, for example, 58% of Democrats said government was wasteful and inefficient, compared with 51% of Republicans. 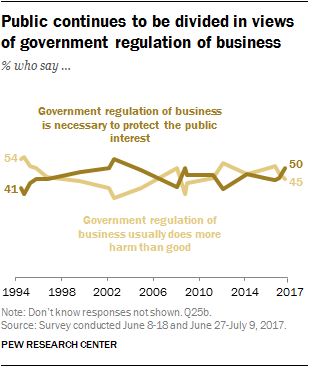 Half of the public says “government regulation of business is necessary to protect the public interest,” while 45% say “government regulation usually does more harm than good.” Views on this question have been divided for the past several years. As with views of government aid to the poor, Democrats’ opinions about the necessity of government regulation of business have moved in a more liberal direction. 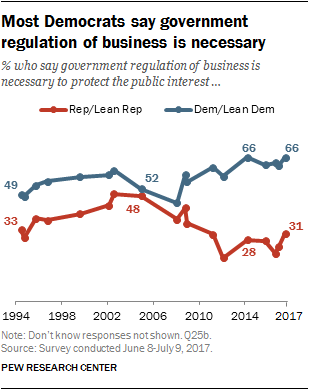 Two-thirds of Democrats (66%) say government regulation of business is necessary to protect the public interest. That is comparable to the shares of Democrats who said this in 2016 (63%) and 2014 (66%). However, Democratic support for regulation of business is now higher than it was during much of the 1990s and 2000s. For example, in 2008, fewer than half of Democrats said government regulation of business was necessary to protect the public interest. Just 31% of Republicans say government regulation of business is needed; about twice as many say such regulation “usually does more harm than good.” These views have changed little over the past eight years, but, during the Bush administration, Republicans tended to express greater support for government regulation of business. In both parties, there are ideological differences in opinions about regulation of business. About three-quarters of liberal Democrats (76%) say regulation of business is needed to protect the public interest; a smaller majority of conservative and moderate Democrats (58%) say the same. Among Republicans, conservative Republicans (67%) are more likely than moderate and liberal Republicans (57%) to say regulation of business usually does more harm than good. Americans continue to be more likely to say that this country has been successful more because of its “ability to change” (52%) than its “reliance on long-standing principles” (43%). Views on this question are little changed since it was last asked in 2015. Americans younger than 50 are more likely than older adults to credit the country’s success to its ability to change: 60% say this, compared with 43% among those 50 and older. Democrats and Democratic-leaning independents (68%) remain about twice as likely as Republicans and Republican leaners (34%) to say the U.S. has been successful more because of its ability to change rather than its reliance on principles. And the ideological divide in these views is particularly pronounced: By roughly three-to-one, liberal Democrats are more likely to say the U.S. has been successful due to its ability to change (72%) than its reliance on long-standing principles (25%). In contrast, conservative Republicans are much more likely to credit the country’s reliance on long-standing principles as more responsible for its success (68%) rather than its ability to change (26%).